Over the centuries, plenty of blood has flowed around these walls, occupied by MacLeods for 800 years since Leod, son of Olaf the Black, founded the dynasty. 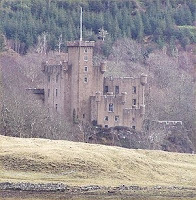 But for modern clansmen the problems really set in after a fire in 1938 destroyed part of the castle. Dame Flora MacLeod decided to commission an architect to construct a new south wing, handing the brief to a certain MacLeod — it was no coincidence — of Inverness. This proved unwise. The resulting “diseased limb” of stone, pebbledash and tar has all the charm of the worst public housing of the postwar era accentuated by the application of grubby harling to the castle walls. To make matters worse a copper roof was installed which failed within four years and has continued failing ever since, rendering many of the private rooms uninhabitable. The buckets indoors speak for themselves. More here on the travails of Hugh, 30th MacLeod of MacLeod: wee Shug.